Gosh, I am going to miss ol’ Trey Obering when he retires in January. Ok, no I won’t. He gave an outbrief today that, I hear, was nothing of the sort — just the same tired hat-in-hand for MDA routine. We smuggled a little spy in, so there will be more on that front later. But I just noticed the other day that General Obering has changed his tune on how many Aegis ships would be needed to defend NATO from an Iranian ballistic missile attack. When I read this, I thought 40? The Aegis defended area or footprint is supposed to be much, much bigger than Obering’s remarks would suggest. Well, well, well. 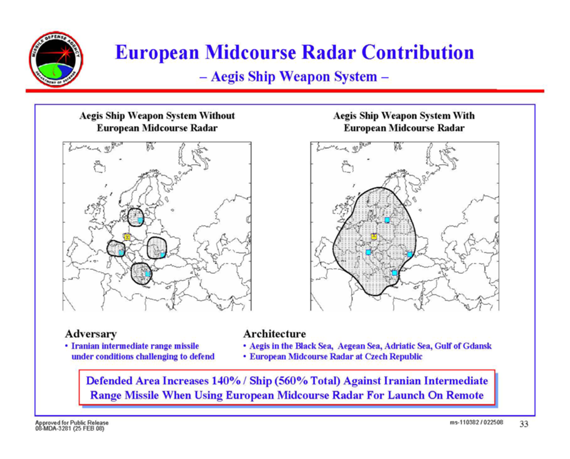 Then General Obering went to RUSI with this chart showing … wait for it … significant coverage of Europe with just four Aegis cruisers. Oh sure, you might want a THAAD battery here or there and maybe a ship or two as reserve. But you clearly don’t need 40 ships to cover our NATO allies and other European partners. Here is a hint, don’t tell Congress one thing and a British thinktank, even a friendly one, something else. India, Israel or the US. As a European, I would far rather not have any missile defences in Europe because that will encourage the morons in Washington to think that they can “win” a first strike against Russia. *** – Gordon Brown and David Miliband seem to like sticking their tongues out at Russia but as they are doing it while hiding behind their mother’s skirt (the US), I don’t think they would actually do anything stupid. Clearly don’t need 40 ships? Not at all clear to me. Not all 40 ships will be on deployment at all times. You got to figure about a third are in the yards getting maintenance, upgrades, etc, about a third will be in training and only sbout a third on deployment. That still leaves about 13. However, missile defense is NOT sole purpose of these ships, they have other missions to accomplish. So it seems possible to me that 40 ships equipped with this capability would be needed to provide necessary 4 ship coverage. You have to think, my man, think through things. TMB: presumably, the ships in question would be dedicated to the mission at hand, since they are a specific replacement for a land-based system. If more ships are needed for other things, then they will be needed for other things regardless of whether the land-based system is built. But four ships at sea will be needed to replace the land-based system, over and above all the other ships that are being built for other missions. The rule of thumb is that ships spend six months at sea and six months in turnaround. Multiple crews could reduce that, but let’s assume the rule of thumb holds: eight ships, plus two in transit. Ten. Of course, that assumes that that a confrontation with Iran will come as a “bolt from the blue.” Most of the scenarios I’ve seen indicate that the Iranians would use their (currently nonexistent) nuclear weapons and (currently unable to reach Europe) missiles as a strategic reserve and deterrent in a complex game of brinksmanship, and not simply let fly without concern for a counterstrike. In reality, the Aegis cruisers have the wonderful advantage of being mobile. If the Iranian threat never actually appears, they really could be used for other missions, or to meet real threats instead of notional ones. Once the land-based system is installed in Europe, however, all we can do is hope that someone in the region builds some nuclear-tipped missiles (but not too many!) to justify the money we’ve already spent. You know all these generals. They are brokers for the industry. Many of them actually do this job after they retire! Well, if the other nine ships are out there doing fishery protection or something, (and the other 18 are in refit or training for fishery protection or something,) can you honestly say that those 27 ships are needed for the BMD defense mission which is at that very moment using 4 ships (+4 in refit, 4 in training)? Yes, of course one could buy that many extra units for the variety of missions that the European navies are currently engaged in, but that would bring in many problems of it’s own. Like, where to get all that money, what to do with the ships they have now, what to do when the new ships need replacement all at once, etc. BTW. Any bets this change of mind is connected with that satellite incident a short while back? Hey Blowback! Who wants to “win” a first strike against Russia that has been in Coexistence mode since the 1980s? Russia may have some of old capability left of the Warsaw Pact, but its expansionist intentions are no longer what they were. The real problem today is N Korea and Iran, and in both cases a first strike seems very sane. Agreed, Obering will say whatever it takes to get backing for (conceptually non-functional) MD. His latest spin is saying that Iran now has a missile with a range of 1,250 miles. …and I can conjure doves from the ether using pure thought. There certainly seems to be a major disconnect between the two force figures: four and forty. What requirements process generated those two different figures? Likely conflict scenarios should drive the force requirements process. Agree with TMB, Aegis cruisers are responsible for missions beyond BMD. Aegis forces shouldn’t be considered solely in a BMD context. This is what BBC is showing as Iranian maximum missile range and remember, even that was put under question by a lot here. Now what this 4 or 40 Aegis system, which doesnt include Israel the only “official” ennemy of Iran, is supposed to accomplish is a complete mystery to me. I don’t mind you commenting, but please read the materials before doing so. I answered both of these questions in the previous post. The post contains a long quotation from General Obering, where he makes clear that he assumes keeping 10 ships on station at all times, with 3 additional ships in refit, training, etc. So changing that one assumption reduces the on station need from 10 to 4. Anyway, a perfectly reasonable operational concept for Aegis would be dedicated ships that go out to sea in a tense period. Assuming that some are being refitted, you are talking about an addition 2 or maybe 4. The more important question, though, is why think in terms of a Europe-specific deployment at all? I would think of a global fleet of Aegis ships that can deploy and sustain a certain capability to important regions like Europe, the Middle East and Asia within a given timeframe. This would include some forward-deployed assets, but probably not 40 in Europe. I do not see “solid coverage” over Europe with 4 ships. France and Germany are completely exposed. 10 is probably the right answer if you put a couple on the Danube. With the Czech Radar, France is covered. Much of Spain and some of the UK is not covered — one might, as I said, add a couple of THAAD units here or there to fill out the coverage. But more to the point, I think this is obviously not the optimal distribution of 4 ships — which, among other strange assumptions, are shown defending Europe from the safety of their home ports, instead of at sea. But 10 would be better. The point is that Obering’s FOUR-OH was inflated to suit his own parochial interests, rather than a genuine analysis of alternatives. Looks to me like if they moved the ground radar into germany they’s get better deep coverage of population centers. They could then put THAAD or a couple of Aegis up front where they wouldn’t be as provocative of Russia’s sensibilities. The scenario depicted was based upon SM-3 Block 1A and/or Block 1B missiles against a long-range threat, no European Midcourse Radar or transportable AN/TPY-2 radar, four ships per station, 24/7/365 status to cover as much of Europe (NATO) as possible and to compare land-based interceptors to sea-based interceptors (apples to apples). What was depicted in the chart was the addition of the two radars (launch on remote capability). So, four ship locations is 16, and 40 ships equated to 10 ship stations. Yeah, “Iranian missiles” are the issue here. Sure. Gotcha, wink wink. Oh please do me a favour. blasted boats are nothing to do with the Iranian nuclear threat. Whats happening here? Nice to see Obering finally come around, at least a bit. The lack of budgetary support for SM-3/AEGIS at the expense of ground based NMD has been one of the unfortunate missile defense subtexts of this administration. Isn’t the one serious drawback to using Aegis instead of a land based defense that Aegis is more vulnerable to attack? What happens if one or two boats are taken out or sufficently disabled prior to an Iranian strike? Its a low probability but certainly far higher than the land based system being unavailable. Anyone else laugh at page 4 of the pdf saying the taep’o-dong 2 has ‘flown’? Nice mistake in the detail in Obering’s PDF presentation on page 23 “U.S. National Intelligence Estimate [says] Weapons grade enriched uranium continues to be produced [in Iran]” !!! Actually, fixed land-based sites are inherently more vulnerable than ships at sea because of the ship’s mobility. And as Jeffrey alluded to, mobility brings many other advantages in that AEGIS ships can be deployed worldwide as needed. Mobility also allows optimization in response to a specific threat against a specific country and not simply regional defense like “Europe.” Overall, ship-based MD has a lot of advantages over fixed land-based sites. It doesn’t have to be a perfect system. It doesn’t need to provide 100% cover at all times against all posible threats at zero cost with free cookies and fairy dust. It only has to be better than the ground-based alternative. And it is. By far. ACW wins again, I’m pleased to see. You guys justify my blog-reading at work. Nice one! @Andy – Agreed on the additional benefits of Aegis (mobility and deployability). Not sold they are less vulnerable than land base prior to actual use. Any land base should be sufficiently guarded against an aysmetric threat which would be the only viable attack Iran could put up prior to launching missiles. While probably very low prob., Aegis could be targeted by other boats or subs prior to a missile launch. But you guys are the experts so I’ll defer to you!